A security researcher with Twitter alias SandboxEscaper today released proof-of-concept (PoC) exploit for a new zero-day vulnerability affecting Microsoft’s Windows operating system. “Even without an enumeration vector, this is still bad news, because a lot of document software, like office, will actually keep files in static locations that contain the full path and file names of recently opened documents..,” the researcher said. 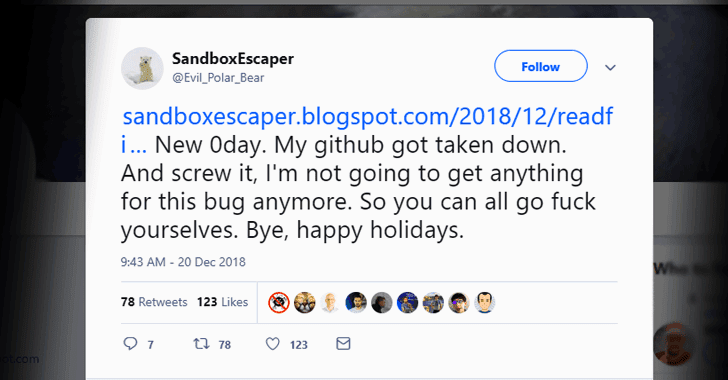 Besides sharing video demonstration of the vulnerability, SandboxEscaper also posted a link to a Github page hosting its proof-of-concept (PoC) exploit for the third Windows zero-day vulnerability, but the researcher’s GitHub account has since been taken down. This is the third time in the past few months SandboxEscaper has leaked a Windows zero-day vulnerability. In late August, the researcher exposed details and PoC exploit for a local privilege escalation flaw in Microsoft Windows Task Scheduler occurred due to errors in the handling of the Advanced Local Procedure Call (ALPC) service, Shortly after the PoC released, the then-zero-day vulnerability was found actively being exploited in the wild, before Microsoft addressed it in the September 2018 Security Patch Tuesday Updates. Posted in Blog, News and tagged # PoC exploit, #ALPC, #Github page, #hacked, #hacker, #mcsc, #Microsoft, #Twiter, #vulnerability, #Zero-Day, The Messiah.